Eva is a dynamic, creative and result-driven marketing professional with over 10 years of experience in start-up and mid-size organizations. She specializes in umbrella manufacturing and premium sourcing. She takes innovative approach and utilizes leading technology in producing leading edge products including the NANO+ umbrella range. 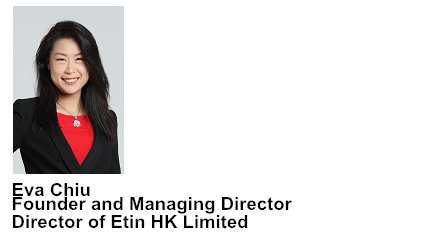 She is the founder and Managing Director of Etin Hong Kong Limited which is a leader in the umbrella manufacturing industry. Her company counts amongst it’s clients some of the top corporations and fashion brand names in the region and has won many awards in the business community. Eva’s vision is to assist and encourage young people to be successful entrepreneurs by providing opportunities for learning best business practice and taking up challenges with a positive mind.